Today, organizations large and small are confronted with a flood of workforce and compliance-based requirements driven by laws, contractual obligations, industry standards, and additional risk factors. 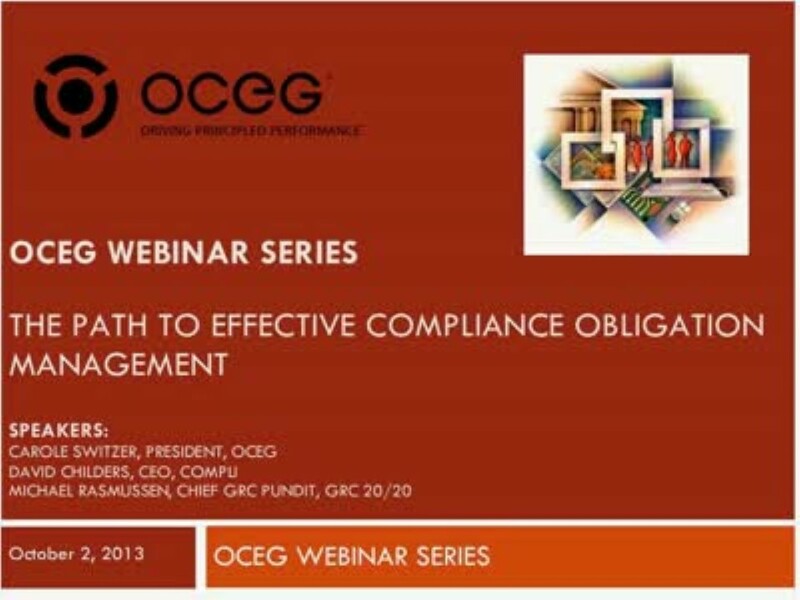 The Path to Effective Compliance Obligation Management (COM) requires organizations to identify and risk-rank their obligations and, with the help of Subject Matter Experts, retune their operational and compliance programs to fulfill COM requirements, mitigate risk, and satisfy regulators, auditors, directors, and other stakeholders. Join OCEG President Carole Switzer, Complí CEO David Childers, and GRC 20/20 Chief GRC Pundit Michael Rasmussen as we discuss best practices for implementing and maintaining an effective “Path” to ensure that as the risk environment evolves, your organization’s COM activities can be categorized and transformed to create a steady state of operational compliance.